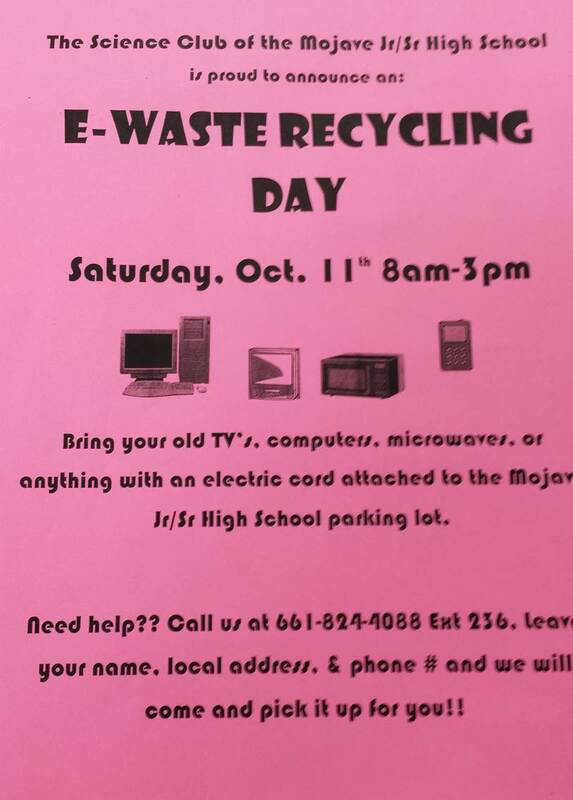 This Saturday, October 11, please bring your old TV, computer, microwave, 8-track… anything with a power chord – and bring it to the Mojave High School parking lot. Drop off is completely free, and is an environmentally-responsible way to dispose of used electronic equipment. The event is sponsored by the Mojave High Science Club, who will be there from 8am to 3pm on Saturday. They will even come pick it up for your if you need help. Call 661-824-4088 (ext 326) if you have any questions or need help transporting your electronics. This entry was posted in Uncategorized and tagged community events, Mojave CA, Mojave High on October 1, 2014 by mojavefoundation. Actually, its October 11th. Thanks!